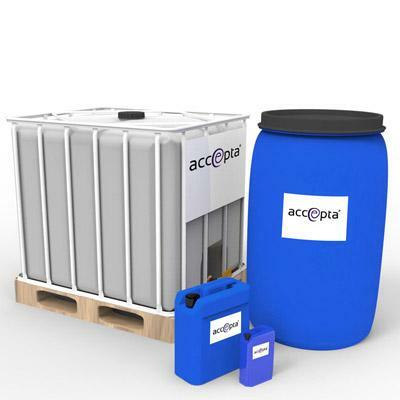 Accepta 0025 is a high performance liquid corrosion inhibitor based on a blend of nitrite and borate that has been scientifically formulated for the treatment of closed re-circulating heating and chilled water systems. Accepta 0025 is based on a nitrite borate blend, which is suitably buffered to ensure stable pH conditions throughout the water systems. Accepta 0025 creates a protective film which is maintained on all metal surfaces. This protective film is kept in constant repair providing the recommended treatment reserve of Accepta 0025 is present in the system water at all times. Accepta 0025 is suitable for use with both ferrous and non-ferrous metals. High performance corrosion inhibitor formulated for use in closed re-circulating heating and chilled water systems. Buffered to maintain the required pH value. Can be used with ferrous and non-ferrous metals. Suitable for LPHW and chilled water systems. Accepta 0025 can be introduced to the system by pump to a suitable dosing point, dosage pot or via the system header tank. The normal dosage rate for Accepta 0025 will produce a system reserve of 1250ppm nitrite with a pH greater than 8.3 for most make-up waters. Where the make-up water has high chloride levels e.g. brackish water, then the normal dose rate should be doubled. A simple test method is available for checking the concentration of inhibitor present.